The profitability of corn production over the years has been marked by spikes of high profitability interspersed with long periods of low and flat profitability. 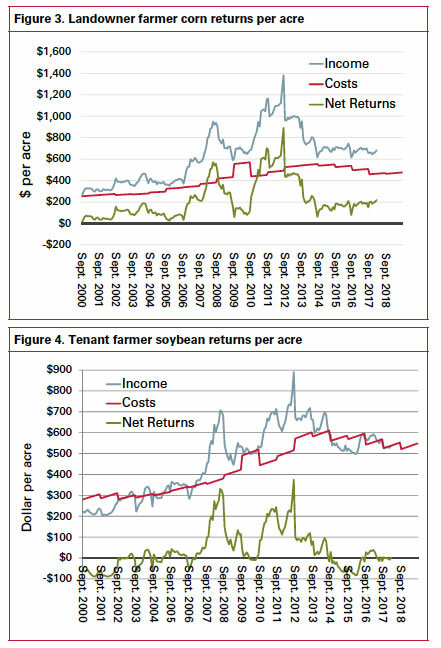 The income, costs, and net returns per acre for a hypothetical Iowa tenant corn farmer from the year 2000 to the present show this trend in Figure 1. During periods of high profitability, there is often an optimism that we are entering a new era of farming where high levels of profitability will go on forever. The optimism is usually short-lived. In their enthusiasm, farmers over- produce, resulting in declining corn prices. This fulfills the old grain trader’s proverb that "high prices lead to low prices". However, when the brief periods of high profitability are over and the industry returns to more normal conditions, we find that the cost structure for corn production has increased. The cost of inputs like seed, fuel, fertilizer and farmland rent increased during the period of high profitability and are now resistant to declining to previous levels. So the new period of low profit margins are at a higher cost level. This trend is shown for corn production in Figures 1 and 2 for the tenant farmer. Prices of all production inputs have increased since 2000, as shown in Figure 2, with some of them substantially higher. Although farmland rental rates increased the most in dollar terms, the increase in percentage terms was modest compared to most other production inputs. Seed corn has increased the most by percent over the time period, followed by diesel fuel. Fertilizer prices had a smaller increase. The profitability of corn production varies greatly depending on how the farmland is controlled. The farmer may be both farm operator and landowner. Or the landowner may be an independent party with the farm operator paying rent for the land. Figure 3 shows the profitability of a farm operator who owns the farmland, without debt. Compare this to Figure 1 for the farmer who rents the farmland (tenant). Although the two operations are identical except for the difference in land ownership, the profitability levels are much different. 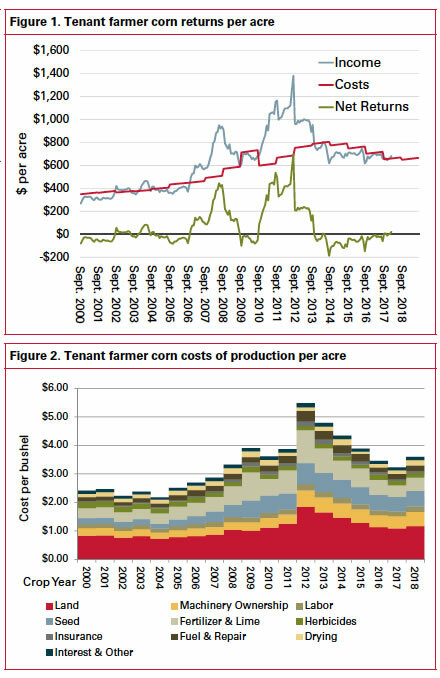 The landowner farmer received good profit margins over the entire time period while the tenant farmer had low or breakeven profit levels except for the two periods of high corn prices. This difference occurs because most of the profit comes from farmland ownership rather than profits generated as the farm operator. This shows that the key to sustaining a long period of high profitability as a farm operator is not necessarily based on the level of grain prices. Rather it is based on the demand for farmland by farmers. With a demand driven market for farmland, farmers bid up farmland rental rates until most of the profits have been transferred to the landowners. Even if the long-term price of corn increases to $8.00 or $10.00 per bushel, over time the profits from the higher prices will be bid into higher farmland rental rates. Of course this is after input suppliers take a bite out of the profit margin. As long as there is a strong desire by farmers to expand their operations and farm machinery companies make ever bigger machinery, the demand for farmland will continue to outstrip supply, regardless of the price of corn. So, over the long term, profit margins for farm operators will remain fairly constant and competitive except at times of short-term high profitability. Conversely, the farmland rental rates will move in parallel with long- term corn price levels and trends in corn yields. So, the long-term profitability of corn production will accrue to the landowner, not the farm operator. The profitability patterns for soybeans in Figure 4 are similar to those for corn, two peaks of high profitability with long periods of low profitability. These farmer profitability models are updated frequently so they show the current status of the long-term trends in the profitability of corn and soybean production, find updates on the Ag Decision Maker website.These spreadsheet models are also interactive so a farmer can enter their own information to compute profitability. The wide variety of financial charts embedded in the spreadsheets provide the farmer with a thorough economic examination of the farm operation.